Laser Marking Vs Laser Engraving : Several governmental and industrial regulations require products and parts to be marked. Since the regulations require the identification of the parts be legible, an accurate form of marking and identification is necessary. Laser technology offers the best solution to ensure that this is done to even the smallest part and with ultimate attention to details. Laser is an acronym denoting the phrase light accelerated by stimulated emissions of radiation. This, therefore, implies that the process is carried out using focused radiations of light. Laser technology offers multiple ways of achieving the identification and marking, and the most popular are laser marking and laser engraving. This post will focus on the two to understand their differences and the suitability for each form of marking. With this information and the distinction of the two as they are frequently confused and used interchangeably, you will be able to settle on the appropriate one for any project that you might be having. This is the most popular form of the laser identification. As a result, the majority of the other forms of laser technology tend to be referred using this term although they refer to something completely different. Essentially, in laser making, the beam of light alter the properties of the surface it is focused to and as a result affecting the appearance. In most of the cases, the area beamed with the light from the laser marker turns black with the desired pattern thus creating an image or text desired. With this form of marking, the best results are achieved on metallic object though it can also be used on plastics. Laser marking is achieved using one of the following types; carbon migration, annealing, coloring, and foaming. With this, the external physical structure is not interfered with, and thus this cannot be felt by touch. As a result, laser marking is preferred for medical equipment as it discourages rusting of the equipment which is a big problem in this field. 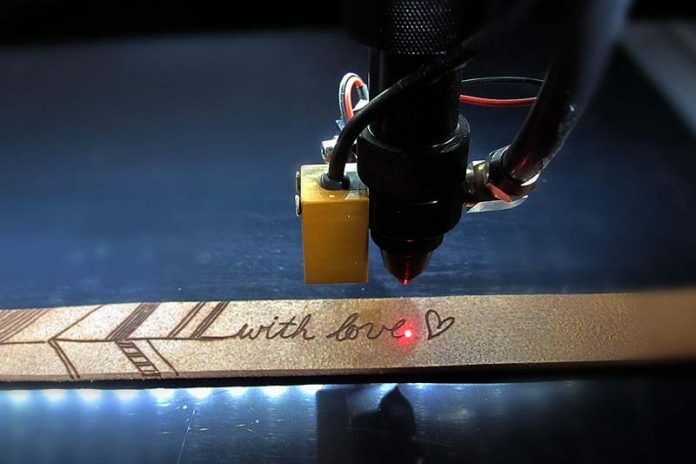 Laser engraving involves a process where the laser beams remove a part of the material exposed to reveal a cavity. The cavity is visible to the eye and can be felt when touched. This form of identification is ideal in the cases where the part being marked is expected to undergo wear and tear. However, there is the disadvantage of that the process may expose the part to oxidation and consequently rusting which is undesirable. With laser engraving, you can achieve deeper marks by repeating the process a couple of time, and it has the benefit that the process is much easier and fast. In engraving, the beams produce high temperatures that cause the material to evaporate on every pulse. The process is common in engraving logos, serial numbers, and several other applications and can work on metals, wood, glass, leather, and even plastic. With the clarification of the two laser technology, it is now easy to decide which fits your project best. In most cases, this is dependent on the nature of the material and use of the product or part.